Read the Tamil version of this article here. 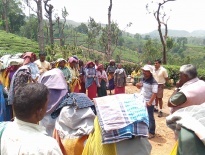 The car was moving from Valparai towards Pollachi through the Ghat road with curves and hairpin-bends. Sitting in the front seat, I was looking out at the roadside of the forest area. When we passed Attakatti we came upon a bare open space . A few metres away from the road, there was a barren tree in the slope of the mountain. As we passed that tree I saw something moving in a fork between the branches of the tree. Immediately, I asked the driver to reverse the vehicle. Once we were closer to the tree, I saw an adult eagle sitting in a nest. After looking at it carefully through my binoculars I realized that it was a Legge’s Hawk Eagle (Nisaetus kelaarti). We parked the vehicle on road-side without hindrance to traffic to spend time observing the nest. Though the nest was some distance away from the road, I could see it straightaway. The eagle had picked up a very nice place and a tree to build its nest. 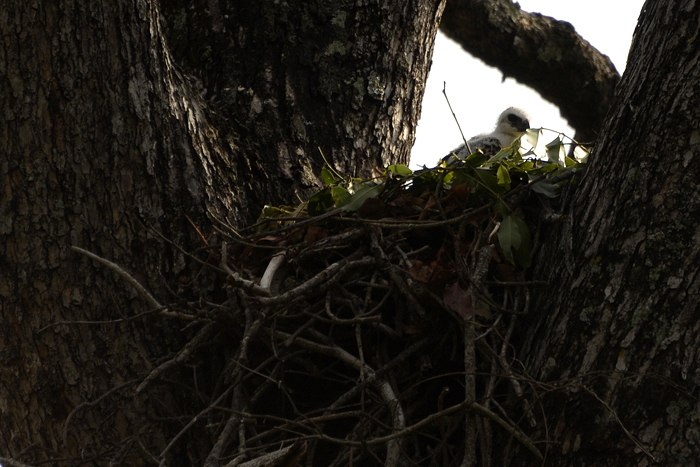 The nest was built like a plate with dry twigs at the fork of two big branches in that towering tree. 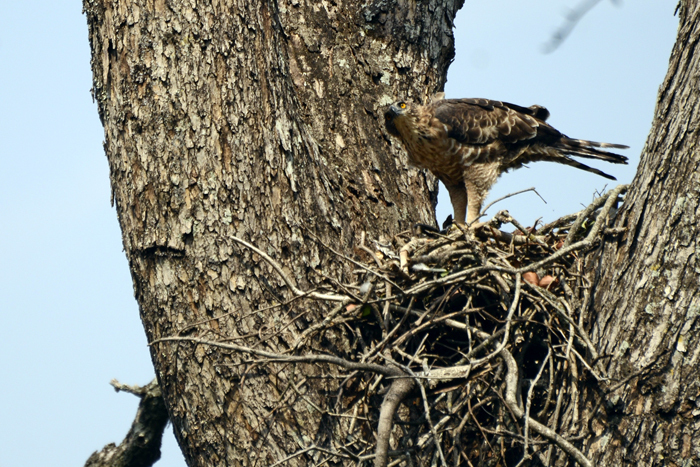 Sitting on the nest was the hawk eagle. It must have been a female. I could not have perhaps seen it while through, had it not made a slight movement. It was arranging the twigs with it’s sharp beaks every once in a while. After some time, it moved side-wards and sat in the nest. Surely it must have laid eggs. After awhile I noticed another individual on a top branch on the left side of the same tree. It must have been a male. Though the nest is built by both partners, only female broods over the eggs. Having seen me taking photographs and sensing my excitement, the car driver Basheer slowly approached me and asked, “Sir, what are you looking at?” I offered my binoculars and pointed him the direction of the eagle. He exclaimed “Sir, it appears so close and its beak is so sharp”, and asked for the name of the bird. I told him that it was Kattu Kudumi Kazugu (Kattu refers to forest, Kudumi means tufts and Kazugu refers to eagles in Tamil) and in English its called Legge’s Hawk Eagle. I pointed towards the male eagle sitting on the branch and asked him to see that as well. After observing the feathers arranged in a tuft on the back of the eagle’s head he asked, “Oh is this the reason that this eagle is called as Kudumi Kazugu?” I nodded in affirmation. 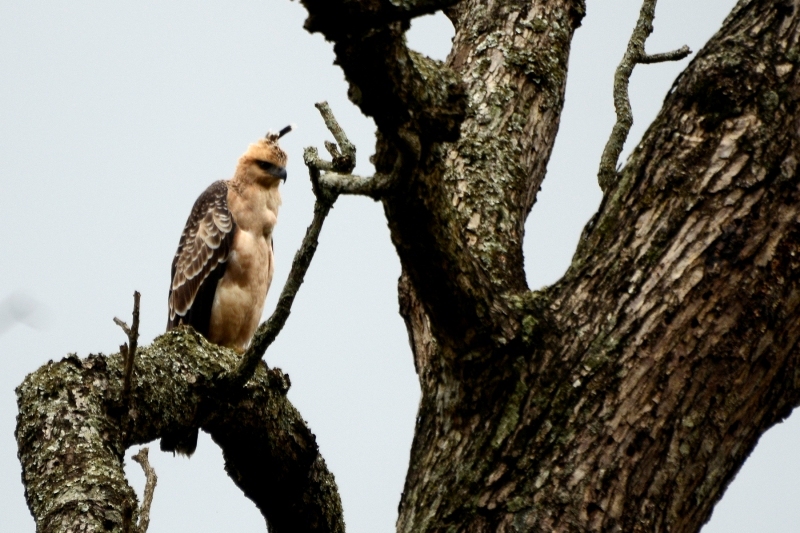 I also told him that there are two types of Kudumi Kazugu in Tamilnadu; the one which we were observing was the Legge’s hawk eagle that occurs mainly in the mountainous forest areas, and the other one, Crested Hawk Eagle, occurs mainly in the forests of the plains. Then he asked me about its food. I told him that they feed on monkeys, langurs, black-naped hare, birds such as Grey Jungle fowl, and are also capable of preying on big birds like peafowl. I added that they also eat small reptiles like garden lizard, and birds like myna, pigeon, and parakeet. He looked rather surprised learning these facts about this bird. We soon wound up and rushed towards the railway station in Coimbatore so that I could catch my train. 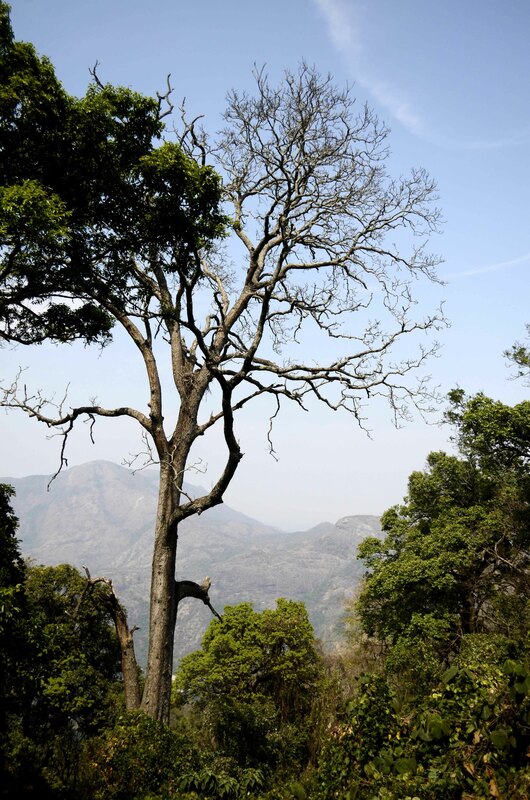 Though not often, I was travelling once a month from Valparai to Coimbatore. Once it happened that the driver who used to come regularly had sent Basheer instead. Only then I came to know him. Basheer is a responsible driver. He never loses his poise or overtakes on the road-bends. He scrupulously follows all the rules that a driver should follow in hilly areas. He shuns taking calls on the cellphone. In case a call is urgent, he asks for permission, parks the vehicle on road-side, and only then answer the call. He is not even talkative. He only answer if asked and that too in monosyllables when driving. This was the second occasion that I was in his vehicle. But after seeing the hawk eagle he posed many questions about these birds and generally about wildlife. I was also answered tirelessly. A month had passed. It was April. Basheer called me and shouted with excitement “Sir, I think the eggs have hatched and the young ones have also come out.” He travels on that route more often than me. He might have been observing the nest whenever he passed near that tree. I asked him how he knew that the eggs had hatched. He replied that he observed some movement in the nest when the adult bird wasn’t around. Four months later, Basheer and I were travelling on the same route again. He stopped the vehicle a few feet away from the tree without waiting for my nod. He looked at the nest through my binoculars. Since there was no sight of the eagle there, he looked at the branches of the tree and his face beamed with joy. While I prepared my camera to take snaps, he exclaimed “Sir, the young one has grown up”. 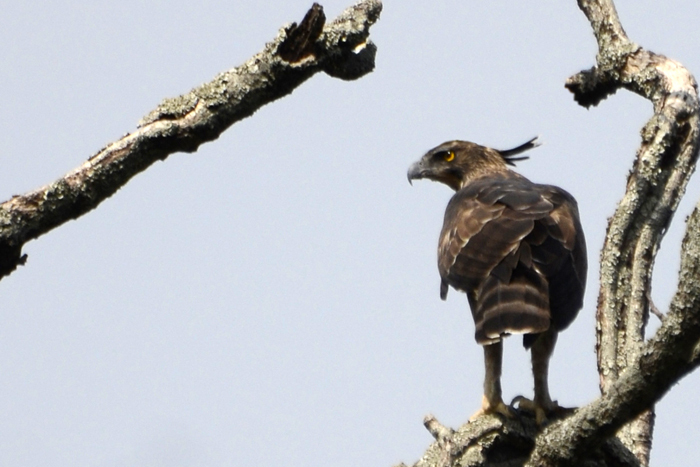 The light brown young one of the hawk eagle was sitting on a branch of that tree. After awhile it called aloud in a Kee…Kee….Kee… noise. With child like curiosity Basheer asked”Sir, is it calling it’s mother? I nodded with a smile. This year I have not travelled much and so I have not met Basheer for sometime. There has not been any call from him either. May be he has been busy with his work. Eagles mostly reuse the nest they built. I am sure that if in case he finds the eagle in the nest, he will call me. This article appeared in SAEVUS Magazine March 2017 issue. See here for the Tamil version of this article published in The Hindu Tamil newspaper on 5th August 2014. NEWS	Elephant Early Warning Systems now in Gudulur!